I would put Steve into the same “pragmatist” school of thought as Diana, exemplified by her quote above. His goal is to protect the innocent and try to save lives, if ending a threat to the innocent means using lethal force against an enemy, he will. But he’s going to work his way up through all the other tools he has to resolve the conflict first. Given that he’s, well, Captain America, he has a lot of non-lethal and less-lethal tools at his disposal. Thing is? He has killed. Why? Because as a soldier, he knows that sometimes the best way to end a fight is to end a life. And best, doesn't mean it's a good thing. Sometimes all you have are bad choices, and you have to pick one, including doing nothing, the best you can do is hope the choice you made is the best one at the time. And with Jabroniville on what's wrong with the Joker. A man with a grudge against Batman is one thing, but a mass murdering psychotic sociopath allowed to recommit time and time again? A line has to be drawn. Steve has killed on the battlefield and when he's had no other options. He does not execute or murder people, which is what you're advocating Batman do with the Joker. He once nearly split the Avengers because Iron Man went to assassinate the Supreme Intelligence, which Cap disagreed with. Cap also hasn't killed people like the Red Skull or Hydra-Cap, both of whom are LITERAL Nazis, even though he's had the chance to. 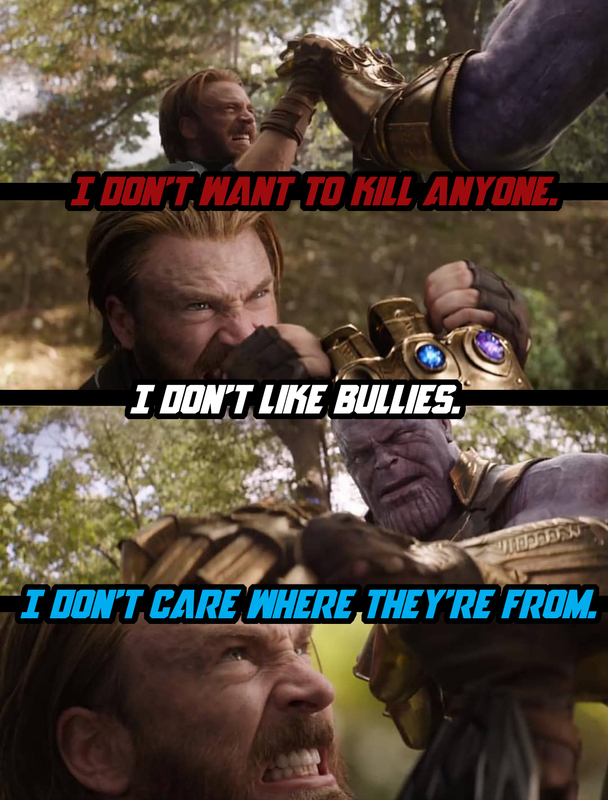 Instead, 99% of the time, Cap will defeat someone non-lethally and send them to jail, and kill only when that person is an immediate threat to the safety of someone and he has no non-lethal options available. Steve is one of the WORST people you could have used to try and justify this with. Steve has killed on the battlefield and when he's had no other options. He does not execute or murder people, which is what you're advocating Batman do with the Joker. At what point does Batman has to consider all the options and the only one is killing Sociopath Joker, to stop him from murdering 1000's more people? He once nearly split the Avengers because Iron Man went to assassinate the Supreme Intelligence, which Cap disagreed with. Cap also hasn't killed people like the Red Skull or Hydra-Cap, both of whom are LITERAL Nazis, even though he's had the chance to. Instead, 99% of the time, Cap will defeat someone non-lethally and send them to jail, and kill only when that person is an immediate threat to the safety of someone and he has no non-lethal options available. And I discount Hydra-Cap, simply because THAT is still the real Steve Rogers, a fact that most people want to ignore. The 'good' cap is a dream fragment from a 'living infinity cube'. The other problem really is that it's the Corporations that own the characters, so they can't actually be killed, because then the revenue stream ends. So really, this is nothing more than a thought experiment for me. Then again, this is why we play Super Hero RPGs, yeah? In my mind, the problem is that Batmna is tollerated in Gotham because what he does is pretty much borderline to a citizen arrest, the moment he kills anyone it's Arkham for him just like all the others. The Batman has considered it. He considers his oath refusing to kill to be an absolute moral imperative, the Joker came closest to getting him to break his moral stance during A Death in the Family and The Killing Joke (canonically) or in The Dark Knight Returns (non-canon), but ultimately Bruce always holds himself back and upholds his morality. That’s the whole point of stories like A Death in the Family. Batman is an individual who operates outside of the law to the smallest degree possible, frequently working with the police as much as he can to protect a city from super criminals that normal police cannot deal with, as well as stopping other crime with the minimum amount of force necessary. The second Batman executes a helpless criminal, regardless of their crimes, he has become a murderer, and has become the very criminal element he strives to fight. Good intentioned or not, he has become a part of the thing that killed his own parents. And if he can justify it once, he can justify it again, and again, to a point where he might not be able to stop. Batman is tolerated because he defeats his opponents with the minimal force needed to do so and turns them over to the police. It is then up to the civil courts of Gotham City to try, convict, sentence and, if necessary, execute criminals lawfully. What you're advocating for is for Batman to murder someone. Hydra Cap was stupid, and extra stupid because Marvel has been shown trying to stick with it when no one bought it, no one liked it, and no one supported it. However. When Steve Rogers, the Steve Rogers whom we all read about for almost 80 years, the REAL Captain America, has been faced with literal Nazis who have murdered far more people than the Joker has, he does not murder them outright or execute them. I reiterate: Steve is the worst person you could use for this. I specifically referenced it. It's also a totally non-canon deconstruction of the character. -killing Batman's arguably biggest and most well known villain is bad for selling comics. Does it make sense from a narrative standpoint after tons of years of these stories? No. But honestly, how much does make sense after fifty years of comics? And short of running an alternate universe story, the guys in charge of the company are going to kibosh any long term offing of any of the big names. On the bright side it has given us a lot of Mark Hammel doing the Joker voice and I do enjoy that. As a vigilante, he walks a thin line already. He's not an actual law enforcement officer. He's not defending his own personal property, his family, his neighbors, etc. He's going out looking for criminals - using highly intrusive methods, I might add - beating the snot out of them, and effectively making a citizen's arrest. What he's doing is illegal, but it can be overlooked. He starts killing, and all that goes out the window. He's a nightmarish vigilante, Punisher-style, the second he starts viewing killing as a viable tool in the belt. Plus, there's an entirely different kind of terror when the vigilante is killing the criminals, and the criminals will arm up to protect themselves more aggressively if the stakes are raised in this manner. It's just not a good idea. Add in his personal convictions, and it's pretty clear he should never, ever resort to killing. Or even ignoring a chance to save a villain, which can look an awful lot like murder from an outsider's perspective. Yes, killing the Joker would spare the Joker's next victims, but considering the implications of shifting the Batman from a caped do-gooder to one more rival criminal trying to kill them, I'm not sure it would be in Gotham's best interest. Batman needs to be a proper hero, not an anti-hero. Hydra-Cap is the "real" Cap according to Marvel's continuity and editorial decisions. This is Exhibit A in the case for why current Marvel Editorial is a clubhouse of stupid and spiteful people who hate the product they're selling us, and want us to hate it too. Another really cool one, breaking down and carefully analyzing how many different parts of the 90s theme song and intro came together into a much loved symphony. A pretty cool Youtube Channel I found where an actual college professor that teaches writing and mythology talks about superheroes, comics and other fiction.